Livermore was desperate to learn where he was going wrong in his legitimate trading, but having lost all his money he had no choice but to return home. But the bucket shops were closed to him, and were fewer in number as the authorities cracked down on them. He made some money trading through a friend in the bucket shops, but soon the bucket shops became wise to his friend as well. By chance one day he ran into a friend of a friend who had an interest in a "legitimate" broker that could get faster execution than the New York firms Livermore had lost his money with. Livermore couldn't understand how this could be done, but realizing execution speed was the key to his success so far, he investigated. 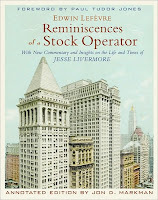 Livermore found a class of firms that were one level above bucket shops in that they did some legitimate trading, but they were mostly bucket shops and so they would give him immediate execution based on the latest available price. These firms would make money by simultaneously telegramming some clients to buy a certain stock and some clients to sell that same stock. The firm would buy a little bit of the stock for real so that the operation seemed legit, but in the end they would profit off of their clients' losses. For Livermore, these companies offered a bucket shop environment (which is one in which he could succeed) and were willing to do business with him (since they were larger operations) and so he set to work. He opened an office and set up direct wires to five of these firms, and another wire to get the latest stock prices. He made some money this way, but was under the distinct impression that some of these firms were trading against him, costing him earnings. As such, he often cheated to increase his earnings. He would place buy orders on a fairly illiquid stock (knowing that these firms aren't actually buying the stock for him), and place a real sell order through a legitimate firm, in effect driving down the price. As such, he would get a great price for his bucket trades. Later in the day he would close out his position by placing a sell order with the five firms, and a buy order with the legit firm, thus getting a great selling price for his bucket trades. In so doing, Livermore saved up enough, despite a lavish lifestyle, to return to New York City to try his hand there for a third time.